Google and a host of net-savvy partners have opened up a free set of web tools to help anyone determine if their net connection is blocking or throttling BitTorrent or otherwise limits their bandwidth. At the moment, three tools are available—when their servers aren't jammed up, and they seem to be pretty popular at the moment. 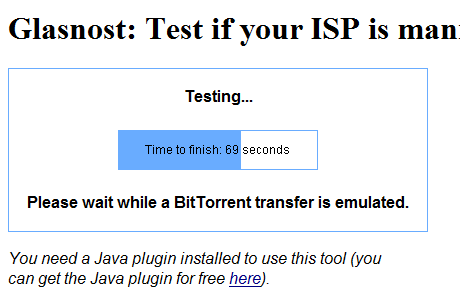 The Glasnost tool determines how your ISP is handling BitTorrent traffic and gives a readout on whether it's being denied, throttled, or otherwise impaired. Network Diagnostic Tool covers other problems that might affect your upload or download speeds. And the Network Path and Application Diagnosis tries to reveal the routing, network tools, and other "last mile" issues that affect net performance. The tests are fairly simple, and each seems to require a working Java plugin to run. The Glasnost test, for instance, creates a fake BitTorrent stream between your connection point and the test's servers, then monitors what happens to the packets. The next two products due out of the "Measurement Lab" are DiffProbe and NANO, which will tell a user whether certain types of traffic, for specific applications or users, are getting priority over others — all handy tools that (should) tell the user exactly why they are or aren't getting the speeds they paid for.